The spectacle-mounted indirect Ophthalmoscope to suit any pupil size. 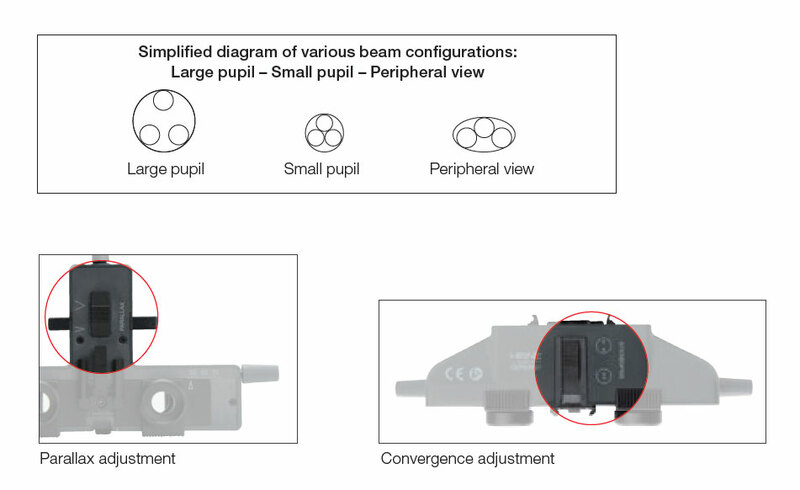 Two separate controls for selecting the ideal setting of parallax and convergence guarantee completely illuminated stereo views in pupils up to 2 mm, as well as viewing in the periphery. The illumination beam can be adjusted by ±3º to eliminate reflexes. Please note: The SIGMA 250 is still compatible only with mPack mini. Extremely light, 110 g without frame. Light and comfortable. Carbon fiber frame. Perfect combination of durability and light weight. 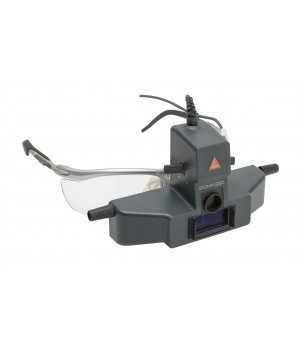 Illumination beam adjustable ± 3°. Eliminates reflexes. Integrated red-free filter. Improves contrast. Detachable blue and yellow filters. For Fluorescence Angioscopy. PD selection from 47 to 72 mm. Suits any user. Optics on swivel mount. Unrestricted view. The advanced One-Step Small and Variable Pupil Control maximizes stereopsis in dilated pupils and allows for the instant adjustment of the optical system to ensure fully illuminated, stereoscopic views through pupils as small as 1 mm in diameter. Dilated Pupil. In the case of a dilated pupil, the HEINE Synchronized Convergence and Parallax Adjustment System adjusts the left and right observation paths as far apart as possible (large angle of convergence) providing for maximum stereopsis (depth perception). The illumination beam is automatically positioned as high as possible relative to the observation plane (creating a large angle of parallax) in order to maximise illumination and minimise unwanted reflections . Undilated Pupils and viewing in the Periphery. In cases of pupils that can not, or should not be dilated, a binocular view with full illumination is not possible without adjustments of the optical system. By adjusting the Small and Variable Pupil Control Lever located on the bottom of the OMEGA Series instruments, the angle of convergence between left and right observation paths is reduced and the angle of parallax (light path) is automatically reduced in one, simple step. The observer can now enjoy a fully illuminated, binocular view with excellent stereopsis  even through a pupil as small as 1 mm in diameter, or in cases where the pupil appears as an ellipse as a result of viewing the periphery. 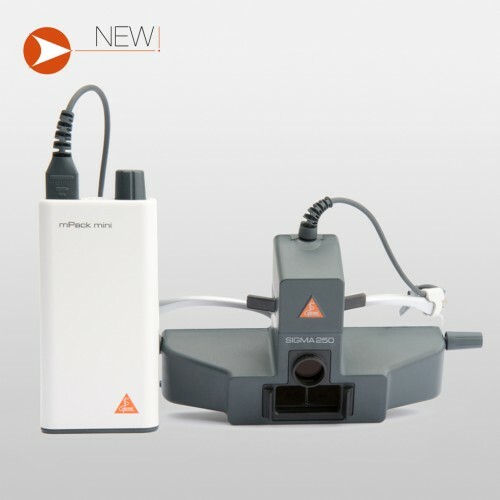 Multiple charging options – mPack LL battery pack is available with charging transformer or optional wall/desk charging station. LED in HQ - The new standard in LED illumination defining optimal light intensity, homogeneity and colour rendering for the most accurate diagnosis. Red is red, blue is blue. Colour temperature: 4,000 K, Colour Rendering Index (CRI) > 90, special index for red colours (R9) > 75 on a maximum scale of 100. This ensures true colour tissue for the most accurate diagnosis. Lithium-Ion Battery Technology in mPack LL – up to 23 hours continuous on-time at full power. LED Thermal Management. LED illumination systems require thermal management to ensure long-term performance and product stability. Carefully selected and applied heat-diffusing materials guarantee consistent quality and performance throughout the LED’s lifetime rating of up to 50.000 hours. Carbon Fiber Instrument Frame – advanced carbon fiber frame offers the perfect combination of durability and low weight.